Females sold well topped at $2150 to average $1980 with 100% clearance. Great buying support from Loxton, Kangaroo Island, Adelaide and Yorke Peninsula . Bulls topped with Lot 6 Arki Montecarlo M20 for $5000 to average $4200 with a good mix of new and return clients. Special mention to our volumn buyer Shannon Brothers Tom and Bill. Carlinga mordred purchased privately from Kym Carlton Boggabri NSW for $20,000. With a quick trip to visit the bull I was very impressed with his soft easy doing type, faultless confirmation and a pedigree to match. This moderate easy doing functional, sound bull was exactly what I was looking for. Winning a few big ribbons already. Congratulations to Kym on breeding a great bull. Kurt Wise, Southend Murray Greys, WA. 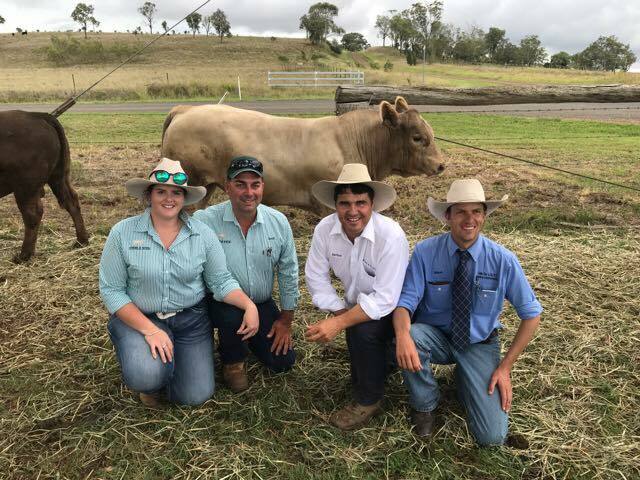 A Mighty day at the Steele Rudd Sale Yesterday with the top priced bull Steele Rudd Mighty going to Tim and Pauline Perkins of The Ultimate Murray Greys , Miles for a price of $11 000. Thank you to underbidders John Contarino and Terry O’Leary of Gadgara Murray Grey Stud, Atherton for making the trip down to support the sale. Thank you to Glenliam Farms and the Whale Team for such an incredible embryo. It was great to see bidders seeing the potential and carcass qualities in this 14 month old bull. Discerning cattle buyers pushed Murray Grey bull prices to $18,000, while Angus bulls/females found solid support at the 26th annual Monterey Production Sale last week at Karridale. Gary and Julie Buller were pleased their sixth annual on-farm sale attracted many long-time supporters throughout WA and the Eastern States. “Buying top sires from grass operators that we know and respect has been the easy-doing advantage of our cattle,” Mr Buller said. 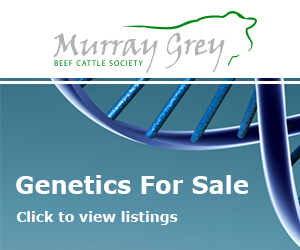 Just under the record average price of last year, of the Buller family’s catalogue of 46 Murray Grey bulls, 37 sold for an average price of $7000, while 29 of the 40 Angus bulls on offer sold for a stud record average $6776. Good support also pushed the offering of 10 registered PTIC Angus cow/calf lots to a stud records including a top price of $12,000 and average price of $7389 for nine three-in-one units sold. Upping the ante for quality, Hampden Farm livestock manager Mick Grey secured Monterey Momentum M24 for the $18,000 top price. Acting on behalf of Hampden Farm principals Gervase and Janice Purich, of Brookhampton, Mr Grey said his selection was “nothing but the best”. “Momentum was our first pick for his style and robust quality, muscling, length and exceptional overall balance, which will have a dramatic impact on our breeding program,” he said. 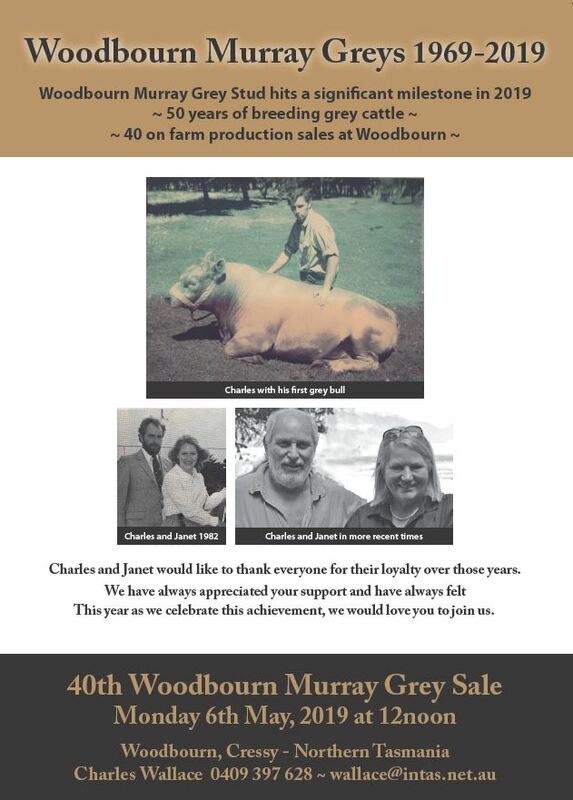 Momentum was offered ¾ share and possession and Mr Buller said M24 was a brilliant son of Monterey Steamroller B140, which produced the stud’s top females. “He is in the top 1 per cent for 400-day weight (+62) and recorded an eye muscle area of 130cm, plus at 1070kg, was the heaviest in the catalogue of all M bulls,” he said. 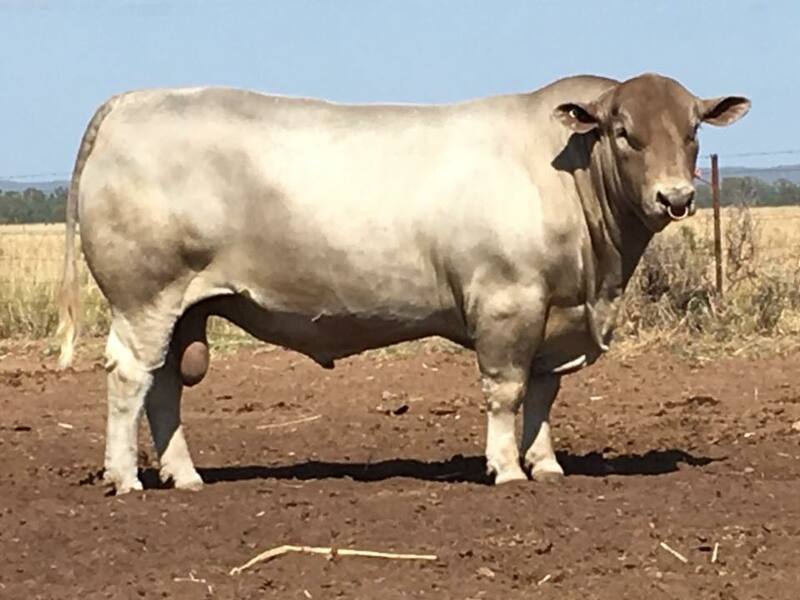 Other Murray Grey bull buyers included commercial cattleman John Inberty, of Silverstone Livestock, Napier, who secured the 962kg Monterey Montezuma M205 for $16,000, a bull which made the grade according to the under bidder, Tullibardine stud principal Alastair Murray. Further stud interest came from Raymond Park, of Gingin, successful on Monterey Major League M30 for $15,000. Eastern State stud interest, Burnett Pastoral Trust, secured Monterey Might Man M79 for $14,000, while local WA account BA & LD James, of Albany, paid $12,000 for Monterey Mandingo M204. Repeat buyers also travelled from the Wheatbelt with Mungatta stud securing Monterey Magnetic M39 for $9500. Volume buyers included account WC BE & DC Avery, of Scott River, taking home four bulls to a top of $10,500 and average of $8000, while Mark Forrester, of Kanandah station, Kalgoorlie, bought five bulls to a top of $9000 and average price of $6200. Commercial cattleman Chris Avery said cattle prices were holding taking into account the 20-year average, but he was unsure of how values would play out with the current build of global cattle supplies. 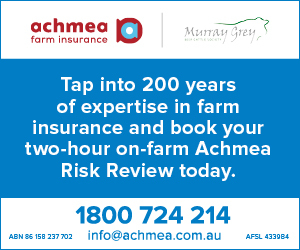 In the Murray Grey female offerings, repeat South Australia buyer Darren Koopman, of Bottlesford stud, was looking for outcross genetics when he secured the $8000 top PTIC Murray Grey cow/calf unit and also paying $7000 for another 3-in-1 cow/calf unit. “Monterey cattle have excellent growth and are easy-doing,” he said. Monterey’s PTIC heifer Rejoyce M232, which was sashed junior and grand champion female at the 2017 Perth Royal Show, sold for $7000 to account CL Harris, of Manjimup. Angus bulls sold to a top of $15,500 with Monterey Mirage M101 setting the benchmark after selling to an undisclosed buyer through Elders Esperance agent Alan Browning. Offered as ¾ share and full possession, the 968kg Mirage was the first son of Millah Murray Docklands J193 offered in Australia and out of a much-admired dam, Monterey Ebony G13. Taking stock out of a Prime Katapault K1 son, Graham Nixon, of Nixon Brothers, New Norcia, secured Monterey Minesweeper M59 for $15,000. 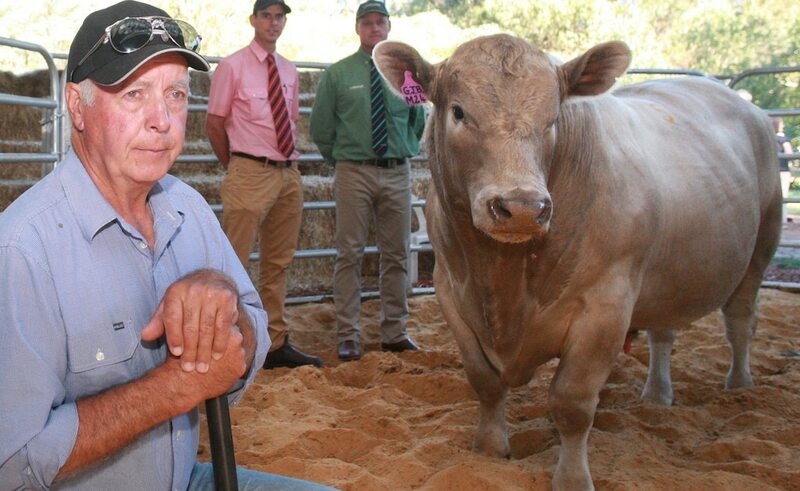 “I liked the bull’s low birth weight (33kg) and carcase qualities plus good feet, tidy sheath and shiny coat,” he said. Monterey Matauri M102 sold for $9500 to account RJ & HM Reid, of Nillup. Angus PTIC cow/calf units sold to a stud record top of $12,000 with Elders agent Alec Williams bidding on behalf of commercial producer Lino Dellagostino, of Esperance. Mr Buller said the quality of Angus sire Vermont Duke E193 daughters were outstanding and Monterey Dutchess K15 came with a quality bull calf-at-foot. Also active on Angus females, Mr Koopman secured PTIC Monterey Vanilla K8 with heifer calf-at-foot for $10,500. Returning to the sale to source Angus females, Julie and Terry Earle, of Roesner Nominees, Harvey, who were assisted by Rob Italiano, secured five PTIC cow/calf units to a top of $8000 and average price of $5583. New buyer Harris Thompson, of Ventura Angus, Boyup Brook, just registered his stud and secured his first Monterey genetic package in PTIC cow/calf, Monterey Stella F65, in partnership with DSK stud, of NSW. Monterey stud co-principal Gary Buller, of Karridale, pictured with the $18,000 top-priced Murray Grey bull, Monterey Momentum M24, as Elders agent Michael Carroll, and Landmark agent Dean Taaffe, look on. A TULLIBARDINE Angus bull hit the top price of $11,000 at last week’s Tullibardine Angus and Murray Grey stud bull sale. 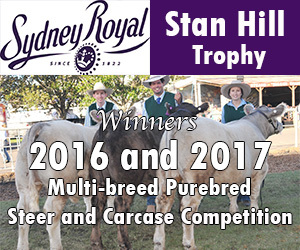 It was another quality line-up of black and grey bulls presented by Tullibardine principals Alastair and Jenny Murray, and once again the stud’s loyal clientele turned up to boost their sire stocks. 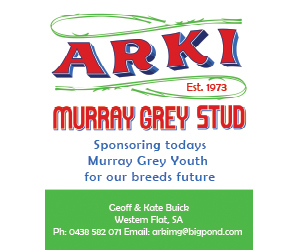 In the Murray Grey section, 22 bulls were offered and 14 sold under the hammer at a top of $8000 and a $5464 average. In the Murray Grey offering it was Kojonup buyer Frank Leusciatti, M & L Leusciatti & Son, Kojonup, that took home the $8000 top-priced bull. A Tullibardine High Noon H32 son, Tullibardine Miami Vice M60 was out of Tullibardine Belinda F84 and weighed 760kg. Mr Leusciatti was a repeat Tullibardine buyer, with this bull the fourth he had bought from the stud. 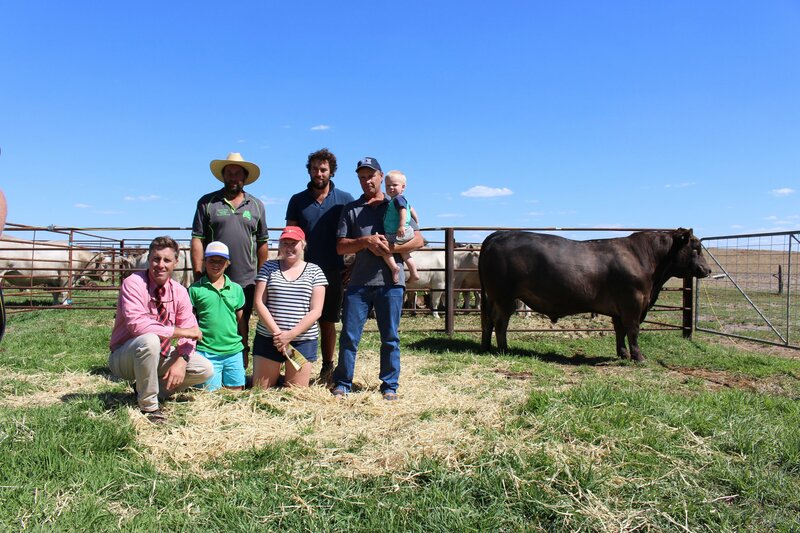 “We run 50 Murray Grey breeders and I was looking for a bull that would go over the heifers and smaller cows in the herd,” Mr Leusciatti said. “We mostly sell calves straight off their mums through the Mt Barker saleyards and we actually topped the sale when we sold them last year. Miami Vice was +3.9 birthweight, +21, +31 and +51 for 200, 400 and 600-day weights. The bull had a raw EMA score of 124cm2 and was 5.6 for frame score. 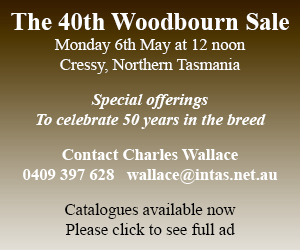 The $7000 second top price bull is heading over east with Charles Wallace, Woodbourn Murray Grey stud, Cressy, Tasmania, the successful bidder. This bull, Tullibardine Magnum M20, was a Melaleuca Jeep 52 son and weighed 898kg. In terms of figures, the bull recorded +23, +40 and +61 for 200, 400 and 600-day weights. It was 43cm for scrotal size and had a raw EMA of 114cm2. Four bulls made the third top price of $6500 and this included the third bull to be offered, Tullibardine Mars Bar M13, which sold to AW & JA Dell’Anna, Napier. Mars Bar was a 902kg bull that shone in the growth figures with a +35 200-day weight (top 5pc), as well as +64 and +92 for 400 and 600-day weights (both top 1pc). It had a frame score 6.2 and had an EMA of 115cm2. The Dell’Anna’s also paid $4000 for a second bull. Others to pay $6500 included MJ & SG Liddiard, Napier, who bought Tullibardine Money Maker M41. Another good growthy bull, Money Maker weighed 832kg and was +24, +38 and +61 for 200, 400 and 600-day weights. Merinvale Grazing, Albany, was another buyer to pay $6500 when it was successful on Tullibardine Magician M1. Magician was in the top 10pc of the breed for 600-day weight (+72) and top 5pc for EMA (+2.9) and retail beef yield (+2.1). Merinvale was also successful on another grey, paying $4000 for Tullibardine Mainbreak M90. The fourth buyer to hit the $6500 mark was another repeat buyer, KW & CR Frost, Kendenup. They purchased Tullibardine Memphis M24, a bull that was +3.4 birthweight and +15, +27 and +36 for 200, 400 and 600-day weights. The Frosts were also successful on two other bulls paying $5500 and $4000 respectively. Larussa Assets, Gingin, paid $6000 for one bull, while the Norton family added to their Angus purchase, taking a grey for $4000. Following the sale auctioneer Tiny Holly said it was a quality line-up of bulls. “Both the shop window and figures of the bulls stacked up,” Mr Holly said. 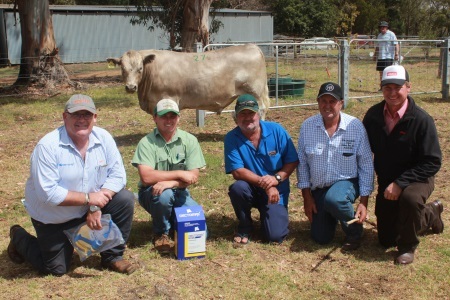 Zoetis representative Ben Fletcher (left), Landmark Kojonup agent Troy Hornby, Frank Leusciatti, Kojonup, Tullibardine Murray Grey stud principal Alastair Murray and Elders Albany territory sales manager David Lindberg and the $8000 top price Murray Grey bought by Mr Leusciatti at last week’s Tullibardine bull sale.